LIMA is designed to manage the methodical application of preventive maintenance plans leading to decrease shutdowns in production machines. LIMA provides the necessary tools to continuously obtain detectable and measurable improvements in production stability and maintenance costs. Reduced shutdown hours due to maintenance. Optimized maintenance material stock in terms of its availability and rotation. Lower maintenance costs. Improved intervention safety. LIMA aims to reduce the incidents that affect machines and installations, based on the methodical implementation of preventive maintenance plans. LIMA provides the necessary tools to achieve significant and measurable improvements on a permanent basis as soon as the program is implemented. LIMA organises a complete historical database that allows you to monitor and analyse the breakdowns and subsequent interventions. Optimise availability and rotation of maintenance material stocks. The actual version, is v7.0 that runs on NAV2013 and NAV2015. If you need to try the actual version of LIMA with any ancient version of Navision Financials, please send an e-mail and we’ll send the correct FOB to you. v8.0 The next version of Microsoft Dynamics NAV, code named “Corfu” is scheduled for release in the second half of calendar year 2015. We do not spend more than three months to check the correct operation with the new version. If you are a final user send an e-mail and we’ll find a partner close to you. We sell through partners only. We provide free support to partners via e-mail. Incidents will be contacted within 24h, incidents will be resolved by support engineer as fast as possible related to the problem complexity. We offer remote or alive demos under quotation. 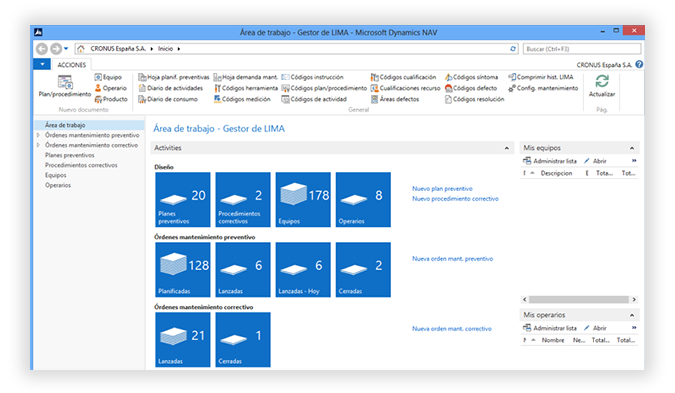 From NAV 2013 to the actual NAV 2015 are supported. If you need to try the actual version of LIMA with any ancient version of Navision Financials, please send an e-mail and we’ll send the correct FOB to you..